12 Days Cairo, Alexandria & Nile Cruise by Flight start to Explore Egypt with 12 Days with 11 nights with beginning to visit sightseeing pyramids and Egyptian museum and take sleeping train to going to visit luxor and Aswan and then back again to cairo going to visit Alexandria sightseeing tour. Breakfast. Start your tour visiting the Egyptian Museum of antiquities. On display is rare collection of 5000 years of art the largest most precious collection of Egyptian art in the world. Including an exhibit dedicated to the Tutankhamen collection of treasures, gold, and jewelry. 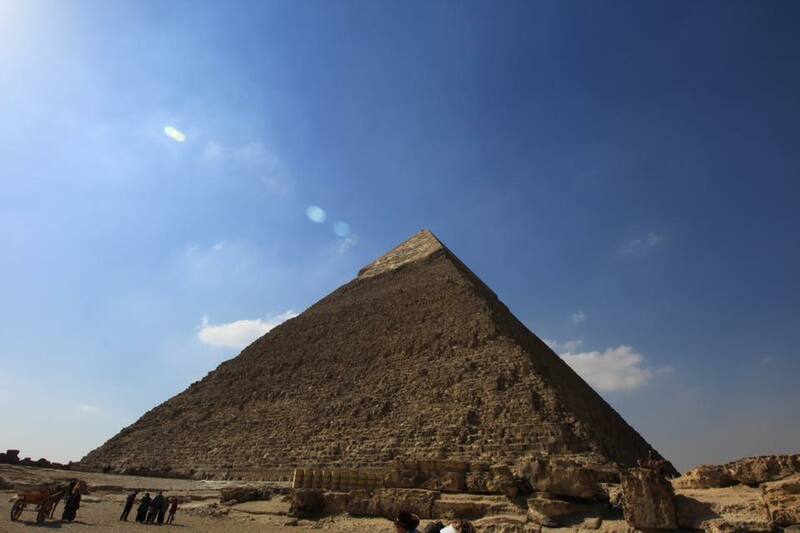 Visit the Great Pyramids – Cheops, Chephren & Mykerions & Sphinx, including a complimentary camel ride. Breakfast. Transfer to the domestic airport. Departure by the plane to Luxor. Arrival and transfer to visit The Temple of Karnak & the Temple of Luxor. Excursion to the Luxor Temple to see its courtyard and the granite statues of Ramses the Great. Proceed to Karnak. (Optional not included) Departure to visit the Temple of Abu Simbel, The colossal Temple of Abu Simbel built by Ramses II (XIXth. Dynasty) and lately saved from inundation of the Nile waters in among the glories of ancient Egyptian monuments. The temples were built out of a sandstone rock cliff, and representation of the deities to which each was dedicated is carved on its huge façade. Nearby, also saved, lies the small Temple of the King’s wife Nefertari, dedicated to the goddess Hathor. Back to Aswan. Transfer to Aswan airport and departure by plane to Cairo. Arrival and transfer to the hotel. Overnight in Cairo. Breakfast. Our tour guide will pick you up from your hotel to start your tour to Alexandria. Travel to Alexandria. Start the tour with the library of Alexandria; the biggest library in the world – now with 8 million books. Visit it’s open court and free museums. (Optional) Our guide will pick you up from your hotel, start full day visit to Alamain. You will get to visit the War Musum of Alamain, where you will see the story of the war, different weapons and outfits for soldiers of all participants forces. Then you get to visit the cemetery of commonwealth & German Cemetery. Breakfast. Transfer to Cairo by an A/C car. Arrival and transfer to visit Salah El Din Citadel which was constructed by Salah El Din on the Moqattam hills in 1183 AD to defend Cairo from the armies of Crusaders. Then proceed to Visit Old Cairo where you will enjoy, the Hanging Church, Ben Ezra Synagogue, Church of St. Barbara, Church of Abu Serga. Move to the hotel & overnight in Cairo. (Optional) Visit the Step Pyramids of Zoser, the world’s oldest major stone structure. It was built in the 3rd Dynasty (around 2630 BC) for King Djoser. After that transfer to Memphis which was founded by King Menes, and was the capital of Old Egypt during the Old Kingdom, it was considered to be a center of rule and culture for over 3000 years the first capital of Egypt, and see the Statue of Ramses II. On your way to the south you will visit the Red Pyramid and Bent Pyramid at Dahshur. Accommodation Plan 5 stars:Le Meridien Pyramids Hotel- Nile cruises: MS Amarco, Ms Semiramis , MS World, MS Domina Prestige Emilio, MS Radamis 2, MS Nile Dolphin & MS Esadora- Tolip Hotel, Alexandria. Accommodation Plan Luxury: Fairmont Nile City Hotel Cairo or Mena House, Blue Shadow, MS Amwaj Nile Cruise, MS Nile Goddess, Sonesta Cruises, MS Nile Premium, MS Jaz Legacy, MS Crown Jubilee- Mediterranean Azur Hotel, Alexandria.